The new openminded techno party in Amsterdam - brings to you deep, melodic and energetic sounds from talented musicians. After two succesfull, sold out editions our new queerparty collective RE:SET will bring you another extraordinary dance night. On Friday March 20th we will make a journey from solid ground throughout the endless width of the Universe, from the bottom to the top. Expect high quality techno from talented newcomers and established artists, an exciting location and a unique and open atmosphere. The party's settled in Warehouse Amsterdam, a cozy club wher intimacy meets industrial with an excellent soundsystem and edgy visuals. 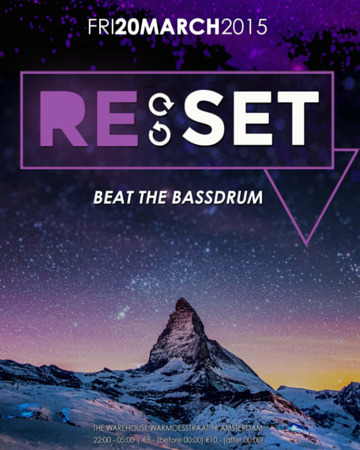 RE:SET is brought to you by a new collective, consisting of Girlesque organizer Bianca Moerel, Flikker organizer Rosanne Bakker-Schut and music lover from the underground techno scene Leonie Kamps.
" And those who were seen dancing were tought to be insane by those who could not hear the music. "